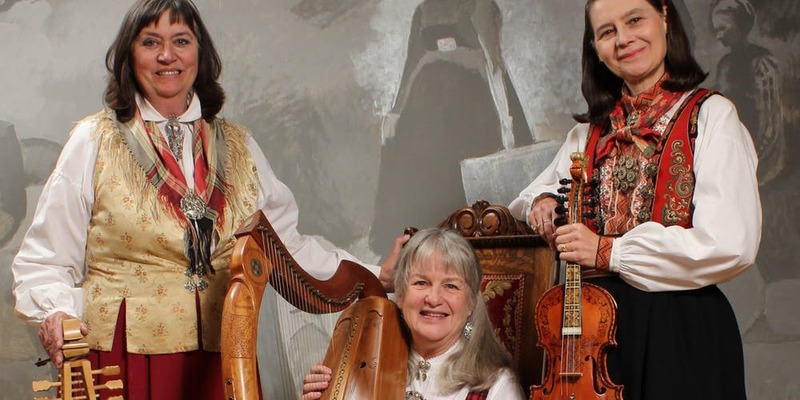 Enjoy the rare opportunity to hear Arna Rennan, Georganne Hunter and Loretta Kelley performing music from Telemark and Ballads from the Middle Ages. Every song and dance tune has an intriguing story and welcomes you into another time and another place. Arna sings and plays the langeleik, a Nordic dulcimer. She received training from Ragnhild Furholt and Frode Nyvold while studying at the Institute for Folk Culture in Rauland, Telemark. Arna performs extensively throughout the Midwest and wherever people are eager to hear traditional folk songs. Loretta Kelley is among the foremost players of the Hardanger Fiddle in the U.S. She has studied the Hardanger Fiddle with many renowned masters of the instrument in Norway. Her CD Hambo in the Snow was nominated for a Grammy in 2007. She is also a founding member of HFAA; Hardanger Fiddle Association of America. Georganne Hunter plays the Celtic harp, interpreting the moods of the dramatic ballads. She is an award winning harpist, as are many of her students. Georganne was a founding member of Willowgreen and has recorded two CD’s which include some of her own compositions; Stoney Point and The Green Stone. Tickets are $10 in advance and $15 at the door.